If you accidentally closed a page without bookmarking and decide you need to see it again, then you can use the 'Most visited' and 'Recently Closed Tabs' features. 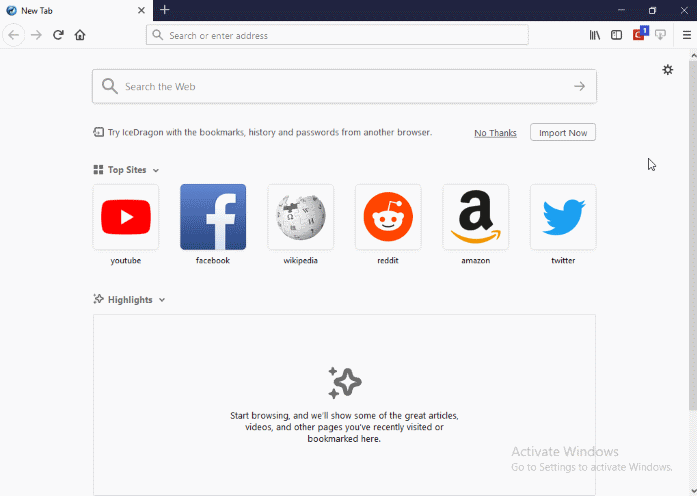 When you open a blank new tab in IceDragon, you will see thumbnails of your most visited sites so you can quickly re-open them. A tab will open containing thumbnails of your fifteen most visited sites. Change the value to about:newtab and click 'OK'. To open all recently closed tabs in a new tabbed window, click the hamburger/menu button at the top-right corner then select 'History' and select 'Restore Closed Tabs'.